An enjoyable walk from West Witton up on to Penhill, one of Wensleydale’s finest hills, via Langthwaite Lane, Nossill Scars and Black Scar. The latest ramble with my little walking group from work this was also the first time I’ve climbed Penhill from West Witton since August 2006. There are in fact multiple options for climbing Penhill from West Witton. On this occasion I decided to go via Langthwaite Lane, a path I’ve not previously used. Parking at the long layby on the eastern end of the village we walked almost the full length of West Witton before turning off on a small lane at the far side. Passing through the tiny hamlet of Kagram this then continued up Chantry Bank, below a well hidden caravan park, until we reached Langthwaite Lane at a steep bend in the road. The walk along the enclosed Langthwaite Lane was most pleasant. Apart from where it passed Langthwaite Wood it afforded some good views of Wensleydale, particularly across to Bolton Castle – a feature that seemed ever present on the walk. After passing below Nossill Scars we gained a track from Swinithwaite. Turning left on this there was a steep pull on to High Lane. Turning left again we now had Penhill well in our sights. After less than half a mile heading east along High Lane we took a path on the right. Passing through Stony Gate we then had another steep little pull up on to West Witton Moor. Crossing over the moor we reached the remains of some old mines. From here we gained a sunken way that zig-zagged its way up the steep fell side between Penhill Scar on one side and Black Scar on the other side. Eventually we reached a gate and a wall that runs above the rim of the two scars. The true summit of Penhill is located on Height of Hazely, a mile or so to the south-west of the gate. 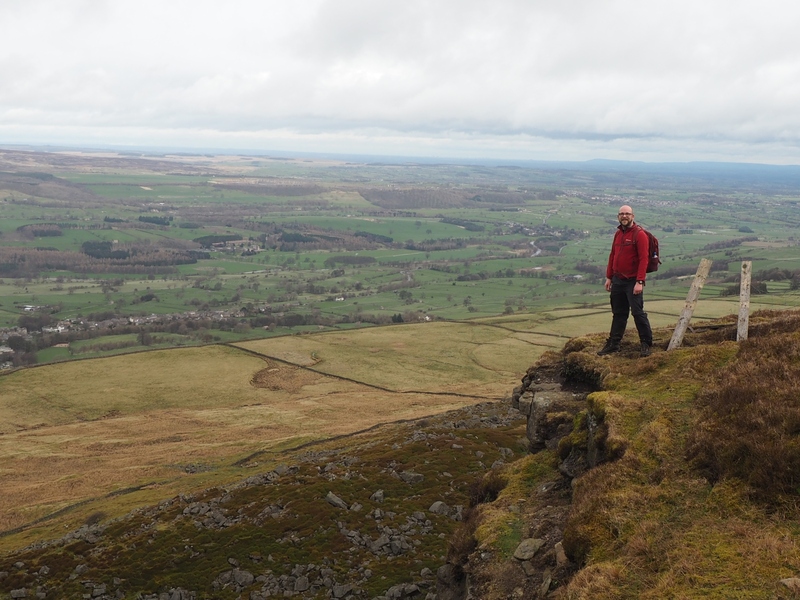 The summit is unmarked and unremarkable so instead of dragging everyone off on a pointless detour we turned left and followed the wall east above Penhill Scar and then on to the Penhill trig point. From the trig point we crossed over the neighbouring wall to gain the edge path again and followed it round to the beacon site and on to the large cairn on Penhill End. When I’d climbed up on to Penhill End from Carlton in January 2016 it was still a solid if slightly delapidated cairn. In the intervening 13 months it has been rebuilt as a shelter which was quite handy for us as it was just beginning to rain and it was lunchtime. There was just enough room for all five of us to huddle inside the shelter for our break. We timed it well because just as we finished the sun came out and we enjoyed a fantastic panorama east across lower Wensleydale towards the distant North York Moors skyline. Visibility was so good that we could also clearly see the chimneys and factories of industrial Cleveland. A steep drop off Penhill End led us along a path known as the Middleham Peat Road which brought us to the West Witton to Melmerby road. Turning briefly left on this we then took a gate on our right to the gallops on Middleham High Moor. The moor is access land though it is wise to follow a sign’s request not to walk on the gallops themselves. Near the far end of the gallops we reached the right of way cutting across to the top of Capplebank. A lovely little path dropping down Capplebank Plantation brought us to a couple of sheep pastures. Descending through these we continued on down a steep narrow path through another wood to reach the wide tree-lined Bay Bolton Avenue. After passing Park Gate on our right all that was left was to take a path on our left that led us all the way back to the eastern end of West Witton and the layby. Throughout the walk the hills further up the dale were largely covered in cloud and we could see plenty of rain showers passing. Not only did we get away with a little bit of drizzle but we also enjoyed a few breaks of sunshine. Getting lucky with the weather only added further enjoyment to our trip out on a hill that rarely disappoints. Sound like a lovely walk and right on our B&B doorstep too.